Since moving to Japan, I’ve realized that the country has some of the most delicious fruits. The flavor gap between the average fruit back home in the US versus one in Japan can be considerable at times, almost to the point that I feel I was deprived. 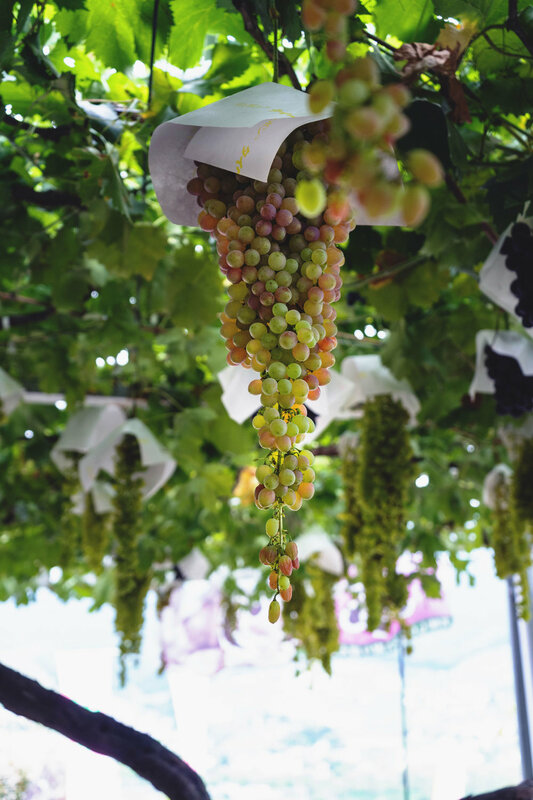 One of the juiciest fruits that I’ve had in Japan is grapes, and perhaps the most well known area for grapes is Koshu in Yamanashi prefecture. Koshu is a couple hours west of Tokyo by car, and is almost fully blanketed with vineyards from mountain to mountain. Unlike other grape and wine areas like Napa, Koshu is quite hilly and full of smaller-sized vineyards. A bunch of them open roadside stands selling their homegrown grapes while a few others make wine. 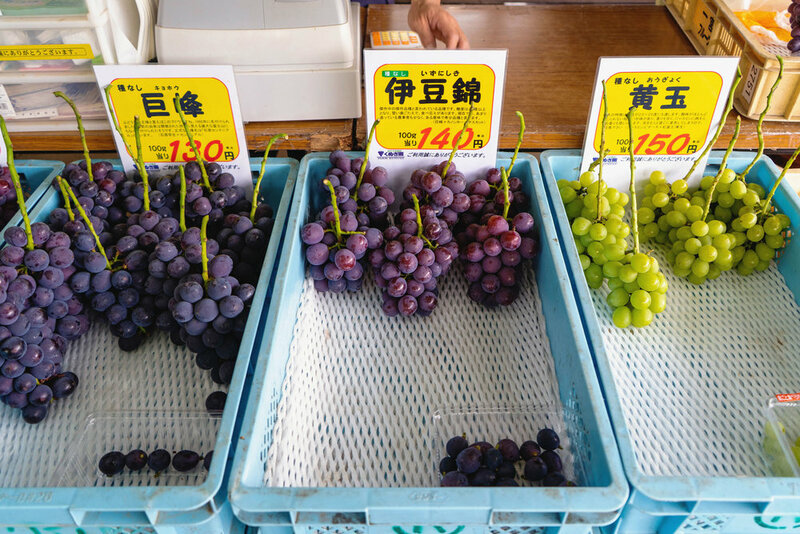 Japanese fruits on average can be slightly expensive, and in mid to high-end department stores, grapes from this area can sell for $60-100 USD per bunch. Part of the reason why costs are higher is because they produce smaller quantities due to intensive pruning, smaller areas of land and because a lot of care goes into growing, shipping and packaging in general. During grape season in early September, I was able to visit a family-run vineyard and get some of the juiciest grapes at the source. A little more than a roadside stand, Farm Kunugi [J] had its own parking lot and a small area of tables and chairs under their vines for people to sit and eat what they just bought. The vineyard began in 1957 and started with 4 types of grapes - Delaware, Kyoho, Fujibutsu and Pione. They’ve since expanded their selection and were selling several of them when I visited. All of them are delicious, but I tend to favor the darker purple ones like the Kyoho. Each grape is packed with such intense flavor. The family was very friendly and they also ship their grapes around the country. Their harvest period is between June and September - going here for fresh grapes definitely beat dealing with Tokyo’s heat and humidity. And they have cute dogs guarding their grapes. After getting full of grapes, I visited the nearby Ikeda Winery [J], a family-owned winery that’s a short drive away from Farm Kunugi. They don’t have a winery or vineyard tour as it’s more of a small shop. The great thing about them though, is that they offer an extensive wine tasting of about 13 different wines. If you buy a bottle, many of which are reasonably priced between $15-40 USD, your money is refunded. It’s a good deal, especially if you like white wine. I’m more of a red guy, but their white wines were quite good - clean, light and crisp. And they have a cute dog as well. The Ikeda Winery family dog, Emma, an older former breeder. After a good day of grapes and wine, we made one last food stop before heading back to Tokyo. Curry at Delhi Bay was recommended to us, so we decided to try it out. It’s a really local, hole-in-the-wall type of spot. 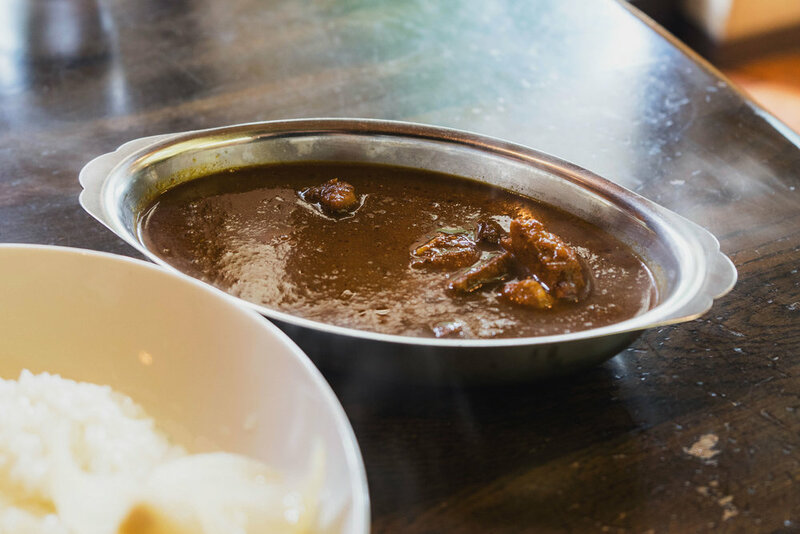 They’re spicier level curries are quite good, and have a few types to choose from that are either Indian or European inspired. Each is served with white rice and pickles.